This natural sodalite sphere was hand-ground and polished from natural color sodalite rough that was mined in Brazil. It has deep blue natural color with white patterns. This natural sodalite sphere was hand-ground and polished from natural color sodalite rough that was mined in Brazil. It has deep blue natural color with white patterns that look like white clouds floating across a blue planet! This unique sodalite sphere was hand-ground and polished from natural color sodalite rough that was mined in Brazil. It has deep blue natural color with white patterns. This natural color sphere was hand-ground and polished from natural color sodalite rough that is popularly referred to as "blue bahia granite", which is mined in Bahia, Brazil. Geologically speaking, it is actually not a "granite" because there is no quartz; the light color minerals are feldspars (plagioclase and microcline), and the dominant mineral present is the rich blue sodalite with some small areas of green epidote. This beautiful collector or decorator sphere has an exceptionally fine polish. This superior quality sodalite sphere was hand-ground and polished from natural color sodalite rough that was mined in Brazil. It has deep blue natural color with beautiful white and orange-pink patterns. This beautiful 14.4 pound decorator sphere has a fine quality finish. It was hand-ground and polished from natural color sodalite rough that is popularly referred to as "blue bahia granite", which is mined in Bahia, Brazil. Geologically speaking, it is actually not a "granite" but rather a "syenite" because there is no quartz. The light color minerals are feldspars (plagioclase and microcline), and the dominant mineral present is the rich blue sodalite with a small amount of green epidote and other dark minerals. The 25x15mm free-form shaped cabochon gem in this natural sodalite pendant has very beautiful dark blue natural color. This unique sodalite pendant was handcrafted in sterling silver. This bracelet was handcrafted in sterling silver and set with five large size natural sodalite cabochon gemstones with 100% natural color. These genuine sodalite cabs measure from 21x16mm up to 37x26mm! The close up photo at left was taken under incandescent light, see also a full-view photo. Sodalite Heart Dimensions: 3.6" wide x 2.7" tall x 1.6"
This heart was hand-crafted from natural color sodalite rough that was mined in Brazil. It has beautiful deep blue color. 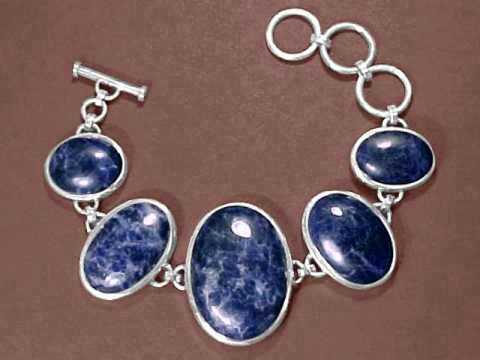 This is the end of our Sodalite Hand-crafted Items virtual gallery page. Would you like us to inform you when we add on this page more natural color blue sodalite handcrafted gift items? We have additonal inventory of natural color blue sodalite carvings and other handcrafted gift items in stock at our mineral warehouses, so be sure to let us know if you have any special requests. Please contact our webmaster or our 'site' geologist with any questions or comments.